Cannot be Normal Summoned/Set. Must be Special Summoned by its own effect, and cannot be Special Summoned by other ways. If "The Winged Dragon of Ra" is sent from the field to your Graveyard while thi.. If this card is Normal or Special Summoned: You can target 1 Field Spell Card on the field; destroy it. Once per turn: You can Fusion Summon 1 Fusion Monster from your Extra Deck, using monsters you c.. If this card is Normal or Special Summoned: Target 1 face-up monster your opponent controls; while this card is face-up on the field, that face-up monster cannot attack, also its effects are negated. .. If this card is Summoned: Return all Set Spell and Trap Cards on the field to the hand. You can banish this card from your Graveyard, then target 1 Set Spell/Trap Card your opponent controls; that Set.. Cannot be Special Summoned. You can pay half your LP; destroy as many cards on the field as possible (other than this card), and if you do, banish them. This card gains 300 ATK for each card destroyed.. Cannot be Normal Summoned/Set. Must be Special Summoned (from your hand) by shuffling all monsters in your Graveyard into the Deck, and cannot be Special Summoned by other ways. 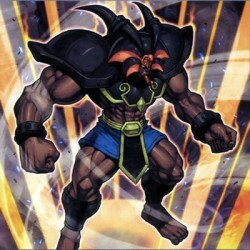 When this card declare..
You can Ritual Summon this card with "Black Illusion Ritual". Once per turn: You can target 1 monster your opponent controls; equip that target to this card. (You can only equip 1 monster at a time to..
You can Ritual Summon this card with "Contract with the Dark Master". Once per turn: You can roll a six-sided die, then destroy all monsters your opponent controls if you roll 1 or 2, destroy 1 monste..
1 "Gaia The Fierce Knight" monster + 1 Dragon-Type monster. This card's name becomes "Gaia the Dragon Champion" while it is on the field. If this card is Special Summoned: You can add 1 "Spiral Spear ..
"Summoned Skull" + "Red-Eyes B. Dragon" (This card is always treated as an "Archfiend" card.).. During either player's Battle Phase: Target 1 monster your opponent controls; take control of it until the end of the Battle Phase, also other monsters you control cannot attack for the rest of this t.. Draw until you have 3 cards in your hand, also for the rest of this turn after this card resolves, your opponent takes no damage. During the End Phase of this turn, send your entire hand to the Gravey.. Declare 1 card name; excavate the top card of your Deck, and if it is the declared card, add it to your hand, then you can add to your hand, or Special Summon, 1 DIVINE monster from your Deck. Otherwi..
To activate this card, you must draw it for your normal draw in your Draw Phase while your opponent controls 3 or more monsters and you control no monsters, reveal it, and keep it revealed until the M..
Special Summon 4 "Sheep Tokens" (Beast-Type/EARTH/Level 1/ATK 0/DEF 0) in Defense Position. These Tokens cannot be Tributed for a Tribute Summon. You cannot Summon other monsters the turn you activate.. When an opponent's monster that was Normal or Special Summoned this turn declares an attack: Destroy that attacking monster, and if you do, inflict damage to your opponent equal to half the original A..
During your opponent's turn: Target 1 face-up monster your opponent controls whose ATK is less than or equal to their LP; destroy that face-up monster, and if you do, take damage equal to its original..
Activate this card by targeting 1 monster your opponent controls; it cannot attack or change its battle position. When it leaves the field, destroy this card. During each of your Standby Phases: Infli..
A fiend with dark powers for confusing the enemy. Among the Fiend-Type monsters, this monster boasts considerable force. (This card is always treated as an "Archfiend" card. )..